This is the benchmark Cuban cigar. 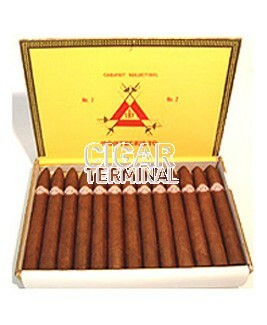 It is superbly constructed, offers ample smoke, and has a wonderful and elegant aroma from the very start of the smoke. There is a reason this cigar is considered one of the finest out of Cuba. While I enjoy other torpedoes/Piramides, this is the basis for comparison...lighter or heavier than the Montecristo No.2...spicier or less spicy...greater or less smoke....stronger or lighter aftertaste...this is the cigar upon which the comparisons for this viola are made. I will always have it in my humidor (2 boxes right now).